The removal of nitrogen by biological nitrification and denitrification is a two-step process. In the first step (nitrification), ammonia is converted aerobically to nitrate (NO3−). 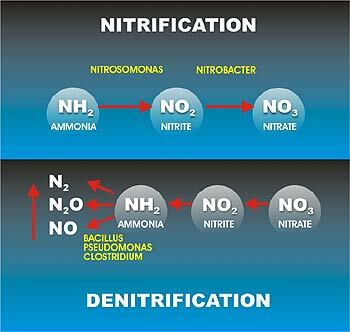 In the second step (denitrification), nitrates are converted to N2O or nitrogen gas (N2) under anoxic conditions. Two‐step biological process in which ammonia (NH4‐N) is oxidized to nitrite (NO2) and nitrite is oxidized to nitrate (NO3‐N). In case of toxic and inhibitory substances in wastewater, two‐sludge suspended growth system may be considered, consisting of two aeration tanks and two clarifiers in series. The first aeration tank/clarifier unit operated at short SRT for BOD and toxic substances removal, followed by nitrification in second aeration tank/clarifier unit operated at long SRT; Nitrifying bacteria grow much more slowly than heterotrophic bacteria. Nitrification accomplished in attached growth reactor after BOD removal or in separate attached growth system designed for nitrification. The nitrification rate for the attached-growth processes is higher than for the suspended-growth processes. Attached-growth processes normally carry more suspended solids in the effluent than the suspended-growth processes. Alkalinity added in form of lime, soda ash, sodium bicarbonate, or magnesium hydroxide. Inhibition effects are dependent on total nitrogen species concentration, temperature, and pH.